The Trump administration, as reported by The Washington Post on March 8, 2017, is looking at cutting HUD's budget by over $6 billion for fiscal year 2018. That's a 14% reduction. The plans include reducing HUD salaries and administrative expenses by 5%. Almost one-third of the cuts would be from the public housing capital and operating funds. 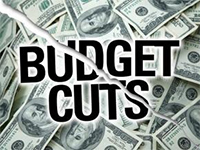 These cuts would hurt low-income families by reducing the availability of subsidized housing vouchers and severely reducing funding for major repairs at public housing, where facilities are already in poor condition. The proposed budget would also reduce funding to house the elderly by about 10%, to house people with disabilities by almost 20%, as well as Section 8 housing and vouchers for homeless veterans. Funding for the Community Development Block Grant Program and the HOME Investment Partnerships Program would also be cut. HUD Secretary Ben Carson responded by writing to HUD employees, "We are working hard to support those programs that help so many Americans, focus on our core mission, and ensure that every tax dollar is spent wisely and effectively." The preliminary budget document obtained by The Post is not a final budget proposal, and was probably prepared before Secretary Carson was confirmed. Read the full article. Got Questions About the New WebTA System? Where on HUD@Work can we find the User Guide? How will employees be paid properly if they cannot access the WebTA system to enter and validate their time at the end of PP 3? How will approved leave requests will be handled if they overlap PP 3 and 4? How will approved leave requests for PP 4 that are requested in PP 3 or earlier be handled? What happens to leave requested but not approved at the time of the conversion? Where and when have employees been given these answers? See our email to HUD for our complete request for information. We Still Don't Know the Answers! Management's only answer so far: "We are making a determination as to its appropriate release." We had expected that a mere two months after the Federal Labor Relations Authority (FLRA) ordered HUD to post a notice promising to "respond timely to requests for information" made by AFGE Local 476 and Council 222, the Department would have learned its lesson. The FLRA had ordered the posting to settle an unfair labor practice charge that Local 476 brought against HUD. Sadly, HUD would rather not give you the answers to straightforward (and we thought, fairly easy) questions. Instead, the Department has allowed the conversion to the new system to proceed while sharing only the most minimal information. During 2015's Pay Period 3, HUD is transitioning to a new WebTA system that will be operated by the Department of Treasury’s Bureau of Fiscal Service/Administrative Resource Center (BFS/ARC). HUD has provided a checklist that all employees must follow in order to make sure that your account transitions smoothly. The checklist has links to YouTube videos that may be helpful. See the checklist and make sure you complete each step by the deadline to ensure you are paid promptly. Read the Supplement that HUD and AFGE Council 222 signed related to implementation of the new WebTA system. 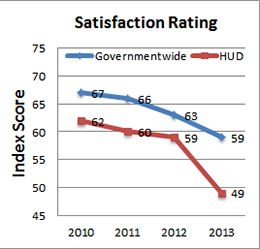 You Said It: "HUD is the Worst Place to Work"
See the full report of the 2013 Federal Employee Viewpoint Survey results. The evidence is in. HUD ranks (once again) as one of the worst places to work in the Federal Government. This is not news as most of us are aware of morale’s downward spiral across the Department in the past few years. As federal employees, we are assaulted on many fronts; conservatives don’t see the utility of federal service and liberals don’t think that we do enough to service our customers. Sadly, it seems as if we are also being attacked from within our agency by upper management that is constantly “transforming” the way that we do business. We have been told to “identify core values” as if we did not possess a collective moral compass that drives us to do our best. Bumper stickers and tote bags are emblazoned with “I believe in HUD” as if WE needed to be reminded of the importance of our jobs and expertise. Now there is a video running on HUDTV with the trite business fiction, “Who Moved My Cheese,” where humans are encouraged to act as mice behave when cheese is moved within a maze. The video asks “Which mouse are you? Are you the mouse that quickly adapts to change or are you the victim who asks “why” the cheese was moved?” To think that those of us who have made careers out of knowing what works best in housing are likened to those who whine and complain with every change is insulting. I truly wonder which core value that thought represents. There is value in asking about the timing and utility of implementing a haphazard, all-encompassing, and extremely expensive New Core shared services agreement in a time of sequestration and cutbacks to our programs. How can our leaders encourage INTEGRITY when major reorganizations are done behind closed doors with no union input at a time when the President has mandated pre-decisional involvement by Executive Order (http://tinyurl.com/kxmsjpz)? How can HUD be EFFICIENT AND EFFECTIVE if multiple field offices are closed without a concrete plan on how our customers will be serviced in those communities? Reorganizations and changes within a new administration are not a new phenomenon; however, a concrete plan and feedback from staff are essential to effective reorganizations. How can TEAMWORK be touted if our leaders have no genuine interest in feedback from staff who have experienced “transformations” before? Can we really expect FAIRNESS/RESPECT from each other when it is not consistently provided by our leadership? How can we hold OUR cheese movers ACCOUNTABLE if we are characterized as troublemakers and encouraged to be infinitely docile and trusting even in the wake of turmoil that is not always productive? I encourage each of you to continue to ask the questions. Talk to your colleagues. Question the changes. Offer solutions to work in partnership with management. Active participation in our Union has never been more important. Join the Union today so your voice can be heard! In a March 2013 report to Congress, GAO noted that HUD has not created incentives or accountability for staff to report accurate workload data. Citing a June 2012 OPM review, GAO stated, "HUD’s human capital and workforce planning activities did not always follow key principles for planning, implementing, and evaluating the results of human capital management policies and practices." GAO concluded that "HUD continues to lack consistent, analytically-based data generated from an effective resource management system...management may not have complete information upon which to make effective resource estimation and allocation decisions." Read the GAO report. You Pay Your Share of Taxes...Does HUD? A HUD Inspector General's report found that HUD's Office of Labor Relations failed pay the Internal Revenue Service (IRS) more than $200,000 in taxes that were withheld from employee wage restitution payments. Employees do not need to be concerned as the tax withholding was credited to each employee affected. See the report. The Multifamily Reorganization and Small Office Closures involve significant front-end costs. Council 222 filed Demands to Bargain in an effort to protect employees who work in offices affected by HUD's planned Multifamily Office Reorganization, which affects over 1,100 bargaining unit employees across the country, and those affected by HUD's proposed closure of 16 "small" offices. Will result in poor customer service and damage to the communities HUD serves. Strips direct and skilled customer service out of 51 offices. Creates a “command and control” model more suited to the 19th century than the 21st century. Encourages more than 24% of Multifamily Housing employees to resign, even though GAO reports that HUD remains incapable of determining its staffing needs. Ignores the cost to the national and local economies due to lost productivity during implementation. Ignores the cost to FHA insurance funds due to increased risk during implementation. Ignores the long term cost to FHA insurance funds due to reduced staffing and oversight. Should permit employees to remain where they are as outstationed employees or placed in other positions in their current offices – saving relocation costs if HUD does pursue this plan. Many employees in the offices to be closed are already outstationed – working on projects in communities remote from their location. Moving outstationed employees results in needless expense. Listen to Council President Eddie Eitches speaking about the planned office closures on Federal News Radio. Council 222 filed Demands to Bargain in an effort to protect employees who work in offices affected by HUD's planned Multifamily Office Reorganization, which affects over 1,100 bargaining unit employees across the country, and those affected by HUD's proposed closure of 16 "small" offices. See the Multifamily Reorganization Demand to Bargain. The Union has also conducted surveys to identify what issues are most important to the affected employees. The Union will use the survey responses to negotiate with management and lobby Congress on behalf of the workers. January 27, 2012. In an effort to resist management's attempts to intimidate your Union representatives, Local 476 had filed an Unfair Labor Practice complaint with the Federal Labor Relations Authority three months ago over HUD's attempt to issue performance ratings to Union representatives who spend a significant amount of time on representational duties. Such ratings violate federal rules on performance ratings. Management agreed to withdraw the improper ratings and abide by OPM requirements in settlement of the unfair labor charge. Read the settlement agreement. September 1, 2011. Eddie Eitches, on behalf of Local 476, reached an agreement with HUD management today to implement a personnel clearinghouse for Headquarters and DC field office employees. Read more. August 17, 2011. AFGE Local 476 and HUD management reached an agreement on reclassifying Legal Technicians as Legal Assistants to provide them with more upward mobility potential. Read more. May 25, 2011. Local 476 filed a Demand to Bargain in an effort to establish a pilot Personnel Clearinghouse program for HUD Headquarters and Washington, D.C., field office employees. The Clearinghouse will help succession planning, improve workforce flexibility, and create a partnership between employees and management. Local Supplement 51 requires the establishment of the pilot Clearinghouse program in partial settlement of an Unfair Labor Practice complaint that Local 476 had filed with the FLRA against HUD. Read more. AFGE Local 476 filed a Demand to Bargain over employee fitness programs at HUD in 2007. Most recently, Local 476 signed a local supplement with HUD that permits employees to use the Capitol View Building fitness center without charge while they are temporarily reassigned to the Capitol View Building during the Headquarters renovations. August 11, 2011. Local 476 filed a Demand to Bargain for Employees Relocated to Portals Building and a request for information in response to OGC's August 4, 2011, notice concerning moving OGC bargaining unit staff to the of the Portals Building. Read more. August 4, 2011. Local 476 and HUD Management signed a Memorandum of Understanding regarding configuration of PD&R's office space. The agreement resolves an Unfair Labor Practice complaint that the Local had filed against the Department. Read more. 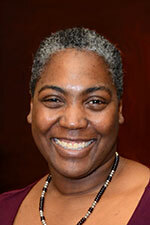 Read President Eddie Eitches' announcement to the Local's membership. May 3, 2011. In response to PIH-REAC's initiation of moving bargaining unit personnel to the Potomac Office Center, AFGE Local 476 has filed a new Demand to Bargain. Read more. March 2011. Three months after the FLRA imposed a Settlement Agreement on the Department, HUD finally complies with the terms. 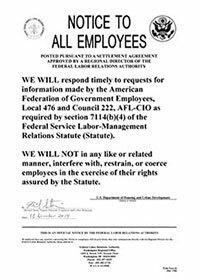 The Local had fought to preserve the rights of bargaining unit employees in PD&R when Management tried to change working conditions without bargaining. The Settlement Agreement requires HUD to post notices to employees promising to negotiate in good faith with Local 476 over proposals that may adversely affect bargaining unit employees by relocatiing work areas. Management also agreed to bargain with Local 476 regarding implementation of a Personnel Clearinghouse pilot program. Read more. March 9 & 11, 2011. Local 476 Demands to Bargain over HUD's unilateral plans to return bargaining unit employees to the recently flooded spaces of the Potomac Office Center. Union leadership has become increasingly concerned that HUD management is not bargaining in good faith on the re-seating plan for the Potomac Office Center and that management is ignoring health and safety for the sake of expediency. See the March 9 and the March 11 Demands to Bargain. January 24, 2011 - Local 476 Files Demand to Bargain Regarding Relocation of REAC staff. Local 476 successfully fought to eliminate the requirement that HUD employees pass through a magnetometer upon entering the building. In July 2009, Local 476 signed an agreement with management establishing new entrance procedures for HUD employees with valid IDs. See the Local Supplement. The Union and HUD have also signed a supplement related to the implementation of Personal Identity Verification (PIV) cards. Below are the most recent Supplements and other documents regarding HUD's Student Loan Repayment Program.